what happened to the other post. It's somewhere in cyber space. Anyways, here's a photo of yesterdays make & take at the Sizzix booth. 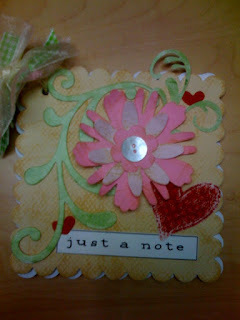 scallop die is a bigz clear die that we cut chipboard to make the book. Well, I'll be back later. Have to leave for work again. love how that scrapbook came out! I better look closely so that when those sizzix come out I can grab them! TFS! hope you're having fun!